Review – Preen Back Yer Lugs! Preen Back Yer Lugs! is a gloriously rumbustious ensemble piece at the Pleasance Dome from Svenska Teatern, mixing scattergun political and linguistic satire with unashamed silliness. Originally a play called Svensk Resning (or Swedish Uprising) by Anders Slotte presented by a Swedish-speaking theatre in Finland, translator Paul F. Matthews has transferred the action to a post-apocalyptic 22nd century Scotland, which is the only country to have survived the nuclear wasteland of World War Seven. The English, who provide the country’s largest ethnic minority, find themselves under threat from linguistic and racial purists whose motto is ‘yin hameland, yin culture, yin tongue’. The rather arch title (that’s ‘pin back your ears’ in Standard English, although the Scots does carry other connotations of preparing yourself, such as getting ready for a feast) suggests we’re going to get an ever-so-pawky, self-satisfied romp. However, while the Scots is used mainly for comic effect, it is also used to satirise the Scots and their preoccupations. The words ‘heid bummer’, for example, would be a perfectly legitimate way of referring to a head of government but have surely been chosen for their comic potential for non-Scots. One of the English characters protests of Scots that ‘it’s all so bloody couthie,’ and it’s this kind of in-joke that peppers the vibrant translation. The ‘heid bummer’ in question, by the way, is the cloned reanimation of one Alex Almond, previous great Scottish leader (not to be confused with the other man of a similar name, who definitely didn’t have a moustache). Unfortunately, Mr Almond is prone to buzz and flap his arms about, as an accident in the cloning process has rendered him ‘half-midgie’. The English don’t escape either, as their supposed reserve and uptightness is constantly pointed out in a variety of exaggerated but thoroughly serviceable accents. 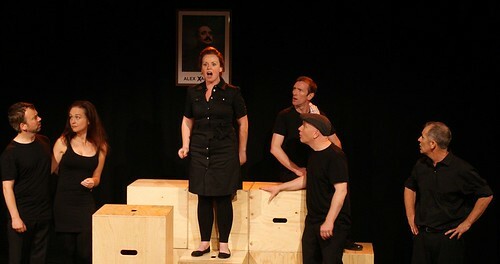 The tremendous company of six constantly swap from Scots to English characters, investing each characterisation with the same gusto that they bring to the singing and dancing. The real strength of the production comes from the energy the entire company give to the piece under the imaginative direction of Aleksis Meaney. Even so, there are some stand-out performances. Sarah McCardie is convincing in both English and Scots, Tom Freeman is gloriously silly as Alex Almond and Billy Mack is able to showcase his more thoughtful, tender side as well as his considerable comic gifts. In the end, despite the sheer enjoyment on offer, this falls just short of the very highest class. There is a very definite lull two-thirds of the way through, as the machinations of Alex Almond’s dastardly plan fall just a little flat. Any doubts about how well the whole scenario works with Scotland and England, hitherto suppressed, surface with a vengeance at the ending. In the original, this may have been a touching plea for international understanding, but here it comes across more like a rather clumsy, mushy defence of the Union.